Upper GI endoscopy is a procedure performed to diagnose and, in some cases, treat problems of the upper digestive system. It can be helpful in the evaluation or diagnosis of various problems, including difficult or painful swallowing, pain in the stomach or abdomen, bleeding ulcers, and tumors. An upper GI endoscopy is both diagnostic and therapeutic. This means the test enables a diagnosis to be made upon which specific treatment can be given. If a bleeding site is identified, treatment can stop the bleeding, or if a polyp is found, it can be removed without a major operation. Other treatments can be given through the endoscope when necessary. Upper GI endoscopy is usually performed on an outpatient basis. The endoscope is a long, thin, flexible tube with a tiny video camera and light at the end. 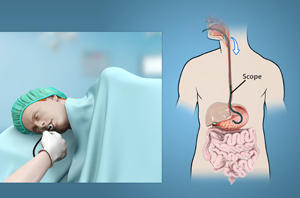 By adjusting the various controls on the endoscope, the endoscopist can safely guide the instrument to carefully examine the inside lining of the upper digestive system. The high-quality picture from the endoscope is shown on a TV monitor which gives a clear, detailed view. In many cases, upper GI endoscopy is a more precise examination than X-ray studies.